FULLY CUSTOM JEEP FOR SALE. 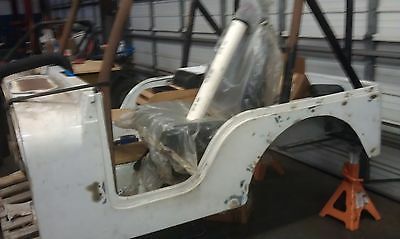 THE ONLY THINGS THAT ARE FROM THE ORIGINAL 1979 JEEP ARE THE FRAME AND VIN TAG.FRAME HAS BEEN BLASTED AND COATED. I HAVE BUILT THE REST OF THE JEEP.THIS JEEP WAS MADE TO PASS DOT INSPECTION. MADE TO BE STREET LEGAL THE BODY IS FIBERGLASS WITH A ONE PIECE HOOD / FENDER / GRILL COMBO THAT TILTS FORWARD . I HAVE ALL THE FRONT TILT HOOD HARDWARE. THE ENGINE I BUILT MYSELF. IT 'S A CHEVY BIG BLOCK BORED OVER .060. I SPARED NO EXPENSE WHEN REBUILDING THE ENGINE. I HAVE OVER $10K JUST IN PARTS INSIDE IT.YOU NAME IT, YOU HAVE IT IN THIS BEAST. BALANCED. BLUEPRINTED.ENGINE WAS RAN ON DYNO AND TESTED AT 593 WITH A 650 CFM CARB THAT IS TO SMALL IT NEEDS AND WAS DESIGNED FOR A 800 CFM CARBESTIMATED HORSEPOWER RATING = 650 FTLBS THE TRANSMISSION INSTALLED IS A T-150 3 SPEED. IT IS COUPLED TO THE ENGINE WITH A CUSTOM BELL HOUSING I MADE.I INSTALLED A BRAND NEW KODIAK CLUTCH. IT IS A MECHANICAL CLUTCH BUT WITH THE RIGHT HARDWARE YOU CAN CONVERT TO HYDRAULIC.I HAVE A DANA 20 TRANSFER CASE WITH A TWIN STICK SHIFTER. THE FRONT DIFF IS A REAL, NOT A GM KNOCK OFF, DANA 44 AND THE REAR IS A GM 14 BOLT. THEY BOTH HAVE 4.10 GEARS IN THEM NOW. I WAS GOING TO UPGRADE.THE SUSPENSION I MANUFACTURED FROM SCRATCH! THE FRONT IS A 4 LINK AND THE REAR IS 3 LINK. THEY ARE ALL CONNECTED TO A CUSTOM TUBULAR "W" BLOCK I WELDED ON EACH SIDE OF THE FRAME. THE "W" BLOCK ALSO INCORPORATES THE TRANSMISSION MOUNT BETWEEN IT. I INSTALLED FOX 2.5s COIL OVERS ON EACH CORNER WITH A 100 AND 150 SPRINGS.THEY ARE BOLTED TO CUSTOM TUBULAR MOUNTS WITH A WELDED ON REINFORCEMENT CROSSBAR IN THE FRONT.LIMITING STRAP TABS ARE INSTALLED ON BOTH FRONT AND REAR AXLES. TWIN YELLOW TOP BATTERIES ARE MOUNTED IN CUSTOM BATTERY BOXES THE BOXES ARE WELDED IN BETWEEN THE FRAME IN FRONT OF THE GAS TANK.BATTERY CABLES ARE RAN IN THE PASSENGER FRAME RAIL TO THE FRONT.BATTERIES HAVE DUAL POSTS ON BOTH TO CONNECT SOUND SYSTEM AND WINCH DIRECTLY TO BATTERIES.METAL GAS TANK REPLACED WITH POLYURETHANE UNIT,ALL NEW HARDWARE! HOSES, SENDER, ETC. ON-BOARD AIR COMPRESSOR MADE BY VIAR IS INSTALLED IN BETWEEN FRAME RAILS THE CONSTANT DUTY COMPRESSOR AND 2.5 GALLON TANK ARE MOUNTED ON CUSTOM HEAVY DUTY MOUNTS COMPRESSOR BUILDS UP 150 PSI AND COMES WITH PLUMBING AND ACCESSORY PACK TO RUN AIR TOOLS AND INFLATE TIRESWAS GOING TO HAVE A AIR HORN AND AIR LOCKERS TOO.HANSON BUMPERS ARE INSTALLED IN FRONT AND REARFRONT HAS WINCH PLATE AND BOTH HAVE D-RING TABS WELDED ONIF YOU DON'T KNOW ABOUT HANSON BUMPERS, GO TO THERE WEBSITE AND CONTACT SOMEONE WHO KNOWS ABOUT OFF-ROAD ACCESSORIES,THESE BUMPERS ARE THE HIGHEST QUALITY I HAVE EVER SEEN. THEY ARE NOT JUST FOR LOOKS, THEY PERFORM BETTER THAN ANY OTHER I HAVE INSTALLED EVERTHEY HAVE EVEN SAVED A FEW LIVESTHEY ARE ALSO THE MOST EXPENSIVE BUT THEY ARE WORTH EVERY PENNY! NEW GEARBOX MADE BY AGR AGR RAM ASSIST STEERING STILL IN THE BOXKIT COMES WITH THE GEARBOX, (THAT IS ALREADY INSTALLED), HIGH PRESSURE PUMP, HYDRAULIC RAM, WELD ON MOUNT TABS, HOSES AND HOSE HARDWARE.GEARBOX IS MOUNTED ON A EXTREME DUTY BRACKET AND HAS A REINFORCEMENT CROSS-RODYOU WILL NOT BREAK OFF THIS GEARBOXWITH RAM ASSIST STEERING YOU WILL BE ABLE TO TURN THE MASSIVE 44 INCH TIRES WITH ONE FINGERNO NEED FOR STEERING DAMPENER WITH RAM ASSIST STEERING!NO "DEATH WOBBLE" WITH RAM ASSIST STEERINGNEW FLAMING RIVER STEERING CLOUMNFULLY POLISHEDSHINY AND NEWGM STYLE LOCK CYLINDER, IGNITION SWITCH, TURN SIGNALSBEST QUALITYEXPENSIVE, BUT AGAIN, WORTH EVERY PENNY NEW SUPER SWAMPER TIRESBOGGERS, 44X19.50X16.5NEVER BEEN ON THE ROADINTERNAL BALANCEDWELD RACING WHEELS8 LUG. POLISHEDALL NEW FINISHING HARDWARECHROME WINDSHIELD, DOOR AND OTHER BRACKETSHAVE ALL WIPER PARTS HEADLAND BEZELS AND OTHER FINISHING COMPONENTS.MOST ALL PARTS I HAVE IN BOXES READY FOR FINISHING. ALL NEW LIGHTINGUPGRADED H11 HEADLAMPS, NEW FRONT AND MARKERS LIGHTS WITH LED LIGHTSROUND LED BRAKE LAMPS WITH LED LICENCE PLATE AND 3RD BRAKE LIGHT. NOT THE CHEAP $39 LIGHTS THESE BRAKE LIGHTS ARE $300. THESE WONT BURN OUT IN 3 MONTHS LIKE OTHER LED LIGHTS.THE TUB IS FIBERGLASS. NO RUST. EVER! !BODY HAS BEEN INSPECTED COUNTLESS TIMES FOR DAMAGEREINFORCED AT ALL MOUNTING AREAS. COMPLETELY CUSTOM CENTER COUNCIL THAT IS INTEGRATED INTO THE BODY ITSELF. HAS STORAGE AND CUP HOLDERS. SHIFTER BOX MADE TO HOUSE TRANS SHIFTER AS WELL AS TRANSFER CASE SHIFTERSWAS SETTING UP FOR A B&M AUTOMATIC TRANS SHIFTER A TWIN STICK T-CASE CABLE SHIFTER. TV MOUNT AND TV INTEGRATED INTO THE REAR OF COUNCIL. 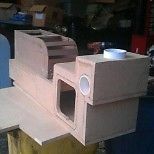 2 - 8" KICKER L7 SOLO BARIC SUBWOOFERS MOUNT ON EACH SIDE OF COUNCIL.MADE OF 3/4 INCH MDF AND FIBERGLASSED OVERDASH MADE OF THE SAME 3/4 INCH MDF READY FOR GLASS6.5 INCH SPEAKER CUTOUTS IN DASH AND 2 SPEAKER BOXES READY FOR GLASS AND INSTALL ON REAR WHEEL WELLS.WAS GOING TO INSTALL SWITCH PANEL, DOUBLE DIN HEAD UNIT AND TV ON PASSENGER SIDE ON THE DASH. 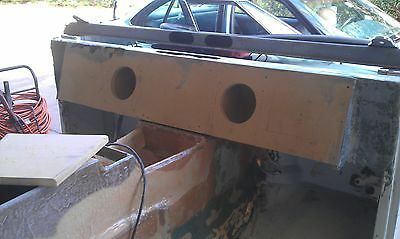 MOUNT THE GAUGES IN PODS AND THEM ON FRONT ROLL BAR.FUEL DOOR WILL BE INSTALLED ON REAR WITH A CHROME ALUMINUM COVER. WINDSHIELD FRAME IS FIBERGLASS AND GLASS IS NEW. I HAVE ALL WIPERS AND HARDWARE. (INCLUDING MOTOR)WAS NOT GOING TO INSTALL SIDE MIRRORS. YOU SIT SO HIGH YOU WONT NEED THEM. ONLY REAR-VIEWWAS GOING TO FINISH INTERIOR IN BED LINERFRONT ONE PIECE HOOD BRAND NEW. NEVER USED. NEW SUSPENSION SEATS AND BENCH SEAT.HAS SLOTS FOR MULTI STRAP BELTS AND TILTDRIVER SEAT HAS NEW ADJUSTER AND BOTH FLIP UP.BENCH FOLDS DOWN AND FOLD UP ALSO. SEATS ARE GRAY AND HAVE BLACK ACCENTSNEW BUSHWACKER FENDER FLARES6.5 INCH. BLACK WITH HARDWARE CUSTOM ROLL BARFRONT TO REAR PROTECTION. ONE OF A KIND.MUST BE CONNECTED TO FRAME WHEN FINISHING COMPACT HEATER BOX,STILL IN ITS BOX TUCKS UNDER THE PASSENGER SIDE DASH AND WILL HEAT THE DRIVERS AND PASSENGER FOOT AREA. THERE ARE TWO VENTS INTERGRTED INTO THE CENTER COUNCIL . IT ALSO WILL BLOW AIR ONTO THE WINDSHIELD. WAS ON THE WAY TO CHANGING BACK TO AUTOMATICI KNOW I HAVE MORE PARTS THAT I HAVE NOT LISTED BUT I CANNOT THINK OD THEM AT THIS TIME.WHEN I REMEMBER I WILL UPDATEYOU WILL NEED SOME PARTS TO FINISH.RADIATOR,HOSES, DRIVESHAFTS, LINKAGE ETC.I HAVE ALOT OF MONEY INVESTED IN THIS JEEP. I HAVE THE RECEIPTS TO PROVE IT. THERE YOURS. THEY GO WITH THE JEEP.IF I COUNTED THE TIME I HAVE IN IT, IT WOULD BE A MILLION DOLLAR JEEP. DUE TO MY HEALTH I CANNOT FINISH MY GIRL. THIS IS A TRUE, ONE OFF CUSTOM TRUCK. I DOUBT YOU WILL SEE ONE LIKE THIS.IF QUALITY AND RELIABILITY MATTERS TO YOU LOOK NO FURTHER.IF YOU HAVE ANY QUESTIONS, PLEASE DONT HESISTATE TO ASK. JUST REMOVED RESERVE!THIS JEEP WILL BE SOLD!!!!!!!!!! !